The topline of the horse can be pictured as stretching from the poll all the way to the tail consisting of the spine as well as the muscles of the neck, back and rump – the body of the horse is all connected, one unit. To have a well built and supple topline is crucial for achieving lightness because it’s through a supple topline you can have the horse elastic, achieve relaxation, straightness, rhythm, impulsion and collection. 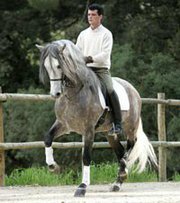 If the horse isn’t supple through the topline you encounter a series of problems such as for example a horse that is unwilling to move forward, lacking true impulsion and self carriage. When the horse’s topline is not supple it will be impossible to carry out exercises with ease and relaxation. It’s necessary to have the horse’s topline supple from that we start to ride him as a youngster until his retirement. Besides supple, we also aim for the horse to build a well muscled, strong topline as this is essential for soundness and athleticism. In the following posts I will address exercises that can help you achieve and maintain a supple topline, while waiting you can read more about the shoulder-in here.